After months of negotiations and works, Barcelona entrepreneurs have their headquarters about. The building of Palau de Mar, owned by the Port, and after a remodeling of 3.5 million euros, starts to receive their new tenants, under the umbrella of the Barcelona Tech City, the cluster that brings together most digital business the city. It will house about seventy companies, new or growing, which will add about one thousand employees. It will be one of the “houses of entrepreneurs” largest in Europe, said yesterday its president, Miguel Vicente. The building of the late XIX, called Pier 01, “among other things because there may be more than one: we demand to fill at least two more,” says Vicente. “It will be a must for foreign investors, and net-working center for entrepreneurs.” In the twin History Museum building, 10,000 m2, and were based Holaluz, letgo and Tiendeo. Just installed Byhours, next week will Antai-BeRepublic-BeAgency group, and then Nuclio, mVentures, Connector, Napptilus, Geenapp, 101Startups, LetMeSpace, Ikomobi, CapitalCell and the cluster, which directs Miquel Martí. Industrial aesthetics and casual decor follow the style of Silicon Valley; the views are unbeatable. 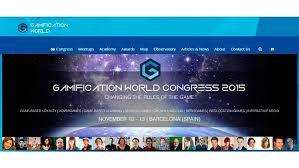 Gamification World Congress was founded in 2011 by Sergio Jiménez, Jose Carlos Cortizo and Arturo Castelló as a meeting point for companies and professionals interested in using game in areas such as customer engagement, employee performance, education, innovation and health. After three annual events, Gamification World Congress has established itself as the international reference point, insomuch as participant numbers, generating business opportunities, developing new market solutions, and sharing success stories and know-how. Now, the organization at Gamification World Congress has taken onboard suggestions from its participants to create Gamification World, the largest international content hub that will now provide continuous online presence throughout the year and all around the world on this exciting trend. Gamification World was born with a number of objectives, following requests from Gamification World Congress participants to build the largest international network of success stories, experiences and know-how surrounding gamification.